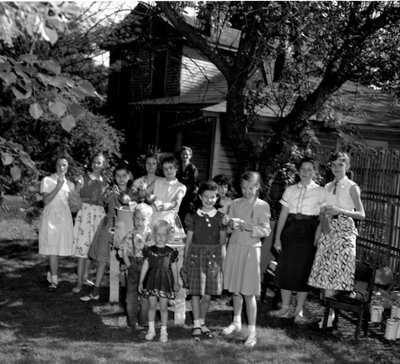 On the back row, far right is Libby Sikes ('57), back row, second from left is Jane Howie ('58), and I think Cindy Haefling ('61) is front row far right. Margaret will know more people. Here comes the ID again! From the left, on the back row: Melissa Benton and Jane Howie (both '58), then an unrecognized girl. In front of them, serving punch, are Glenda Helms and Selma Dove (both '60). The little girl in the back looks like Leonora Howie ('60). In front of her are Sarah Ann Hill and Cindy Haefling (both '60). The two older girls on the right are Faye Nell Medlin and Libby Sikes (both '56). I don't know the little boy and girl nor the lady in the back. Libby Sikes is from the class of 1957 rather than 1956 (my class)! Sometimes the fingers work faster than the brain!! Funny - girls wore dresses or skirts and blouses back in the olden days :-) And I bet they all had to be ironed. Did we not have any shorts, slacks or jeans? Mary, I don't recall having a pair of jeans until my sophomore year in college. We had bermuda shorts and slacks, all of which had to be covered with a raincoat when we left the dorm or were anywhere on campus. We did spend a lot of time ironing back then. I loved winter because we only ironed the collar and cuffs and hid the rest under crewneck sweaters.